When considering getting nail extensions you are most likely going to do some research and see a dizzying array of terms, such as, gel, UV curing, acrylic, fiberglass, and overlay. Nail extensions have come a long way from the days of press on nails, however, one basic concept still remains in their application, and that is the use of a nail tip. Gel is a special mixture that is applied either on top of an artificial nail extension, or directly onto the natural nail bed to strengthen the nail and promote natural growth. The gel is usually applied in very fine layers, with the nail technician ‘curing’ or ‘sealing’ the gel with a UV light between each layer so that the finished result is hard but still flexible with a natural looking glossy finish which is both instantly dry and chip resistant. 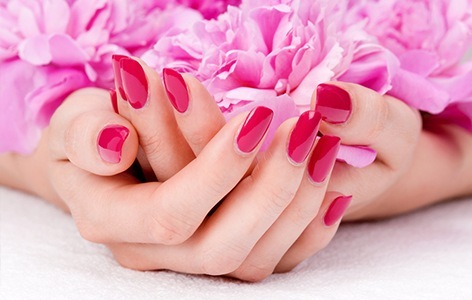 Another alternative to having acrylics or gels is to have fibreglass or silk wraps applied. This process involves cutting pieces of fibreglass or silk to fit the nail bed or tip, before sealing them into position using resin or glue.